Dance has always been an important aspect of all human cultures, and the study of human movement and action has become a topic of increasing relevance over the last decade, bringing dance into the focus of the cognitive sciences. Since the first edition of The Neurocognition of Dance was published, research into the cognitive science of dance has expanded extensively, with the number of scientific studies focusing on dance and dance-related topics in cognitive psychology growing significantly. 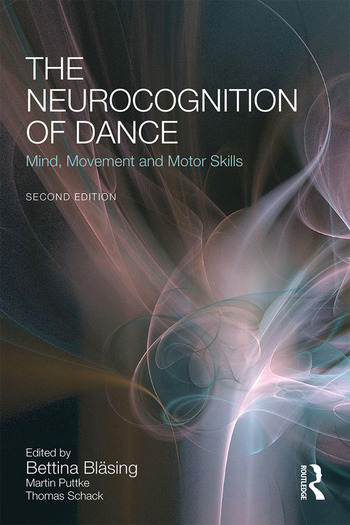 Featuring three new chapters addressing topics that have become highly relevant to the field in recent years – neuroaesthetics, entrainment, and choreographic cognition – as well as progress in teaching based on novel methods, this comprehensively revised and updated new edition of The Neurocognition of Dance is full of cutting-edge insights from scientists, researchers, and professionals from the world of dance. Also now including online material such as links to video clips, colour images and hands-on material for practical application, this book is an essential companion for students and professionals from fields including dance, cognitive psychology, sport psychology and sport science, movement science, and cognitive robotics. Martin Puttke: Learning to dance means learning to think! Guido Orgs, Beatriz Calvo-Merino & Emily S. Cross: Knowing dance or knowing how to dance? Sources of expertise in aesthetic appreciation of human movement. Bettina Bläsing is a Responsible Investigator at the Center of Excellence Cognitive Interaction Technology (CITEC) at Bielefeld University, Germany. She studied Biology at Bielefeld University and Animal Behaviour at the University of Edinburgh, Scotland. Bettina worked as science journalist and editor, as scientific coordinator at the University of Leipzig and as a postdoctoral researcher at the Max Planck Institute for Evolutionary Anthropology before joining the Neurocognition and Action Research Group at Bielefeld University in 2006. Her main research interests are mental representations of movement, body and space, the control and learning of complex full body movements and manual actions, and expertise in sports and dance. Martin Puttke was formerly a dancer, headmaster and artistic director of the State Ballet School Berlin. He was also the ballet director of the State Opera Ballet Company Berlin and of the Aalto Ballett Theater Essen. He is a renowned ballet pedagogue. In 1988 he became a Professor at the Hochschule für Schauspielkunst 'Ernst Busch' Berlin. His main interest is the renewal of the school of classical dance by his new system DANAMOS. Thomas Schack is Professor and Head of the Neurocognition and Action Research Group at Bielefeld University. He is Principal Investigator at the Center of Excellence Cognitive Interaction Technology (CITEC) and member of the Research Institute for Cognition and Robotics (CoR-Lab). His main research interests concern mental movement representation, mental training, cognitive robotics and the neurocognitive basis of complex movement.